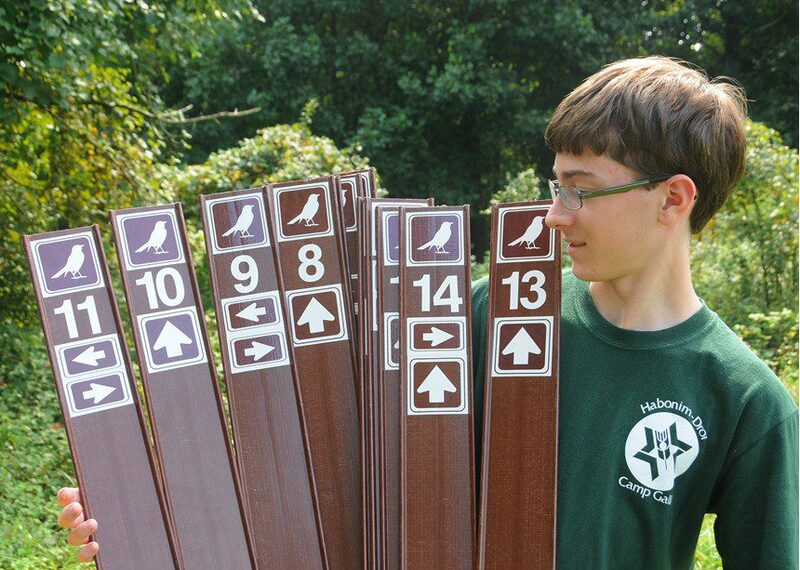 Joel Rice looks at the trail markers for his Eagle Scout project at Middle Run Natural Area. Image by Derek Stoner, August 26, 2011. On Sunday, September 4th, the culmination of more than eight months of hard work and volunteer effort will be celebrated with the Grand Opening of the Middle Run Birding Trail. Eagle Scout candidate Joel Rice planned and organized the project which enhanced the early-successional habitat at Middle Run and created a specially-designed trail that showcases the very best locations for viewing birds and other wildlife. Tours of the Trail will be offered at 9:30am and 11:30am, and a Ribbon-cutting ceremony will take place at 11:00am. Throughout the whole morning, visitors will be taking part in the Third Annual Bio-Blitz as they document the birds, butterflies, dragonflies and other creatures to be found along the trail. 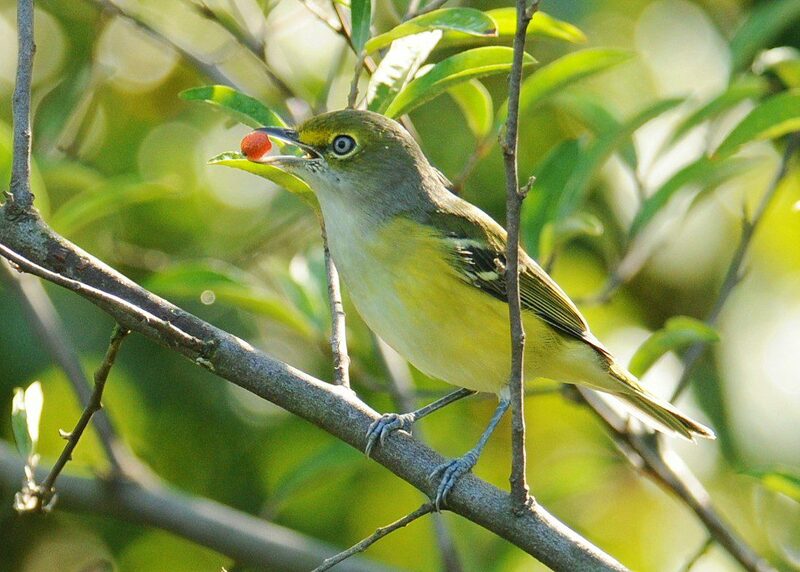 A White-eyed Vireo loads up on fruit (Autumn Olive) at Middle Run Natural Area, at Trail Marker #5 on the Middle Run Birding Trail. Image by Derek Stoner, August 30, 2011. Fall migration is in full swing right now for a variety of songbirds and raptors. Hikes along the Middle Run Birding Trail in the past week brought sightings of birds like American Redstart, Magnolia Warbler, Prairie Warbler, Eastern Wood-peewee, Bobolink, Blu-gray Gnatcatcher, and this…. 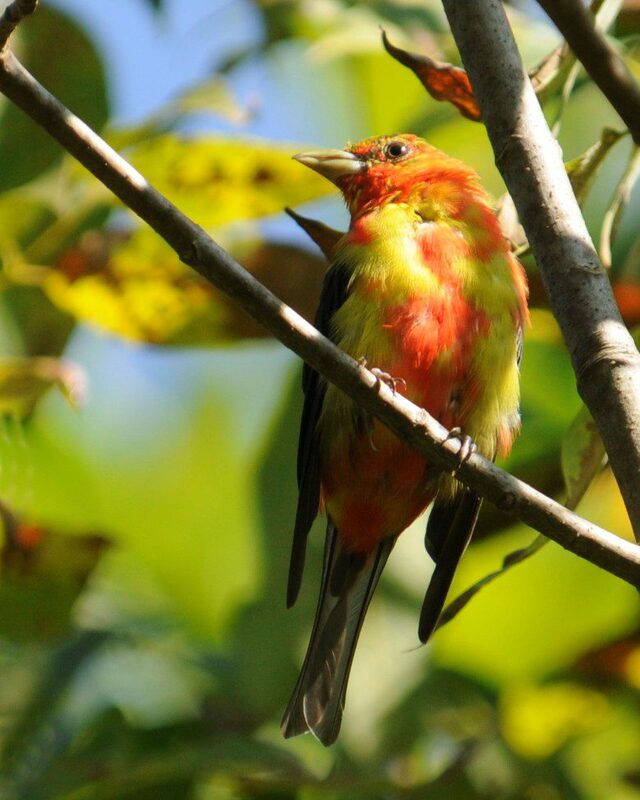 An adult male Scarlet Tanager molting from breeding (red) plumage to non-breeding (yellow) plumage. Image by Derek Stoner, August 30, 2011. … a gorgeous male Scarlet Tanager in a very interesting transitional plumage. Brilliant red mottled with patches of yellow, this bird is in the process of molting out of its breeding plumage to its non-breeding colors that it will wear through the winter it will spend somewhere in South America. 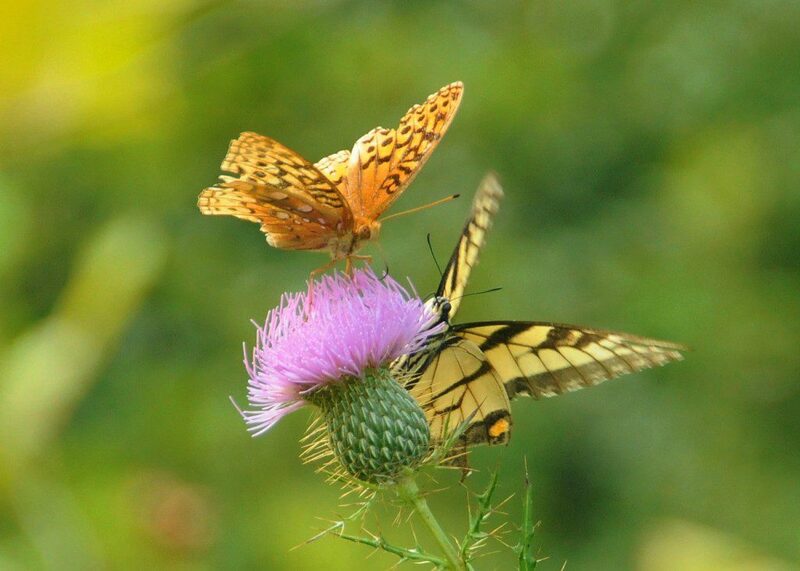 A Great-Spangled Fritillary and a Tiger Swallowtail enjoy the nectar of a Bull Thistle at Middle Run. Image by Derek Stoner, August 26, 2011. Butterflies are out in force at Middle Run right now, taking advantage of the many sources of late summer nectar: Bull Thistle, Goldenrod, Aster, Butterflyweed, and Milkweed. In the past few days, butterflies like Buckeye, Red-banded Hairstreak, and Wild Indigo Duskywing are the notables among the more common species like Monarch, Great-spangled Fritillary and Tiger Swalowtail. Come out and help us find more butterflies, birds, and other interesting animals along the Middle Run Birding Trail! The Grand Opening of the Middle Run Birding Trail will take place at the main parking lot of Middle Run Natural Area off of Possum Hollow Road in Newark, DE. Look for the yellow signs and follow the gravel driveway to the parking area at the end of the driveway. Kudos to Joel……can’t wait to visit! Amazing job Derek- I will plan on a walk when home the end of Oct. Photos are great!